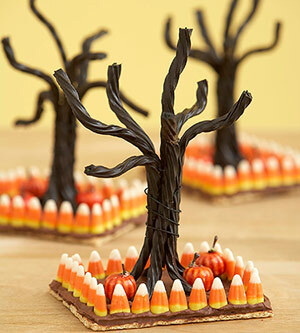 With Halloween right around the corner, your little ghouls and ghosts are sure to love these craft ideas. For each decoration, you'll need to accordion-fold 8 1/2-by-11-inch sheets of colored paper, making 1/2- or 3/4-inch folds. For small faces, accordion-fold 3 sheets of paper vertically, then bend each in half to make a fan. For medium, accordion-fold 6 sheets horizontally. For large, accordion-fold 11 sheets vertically. For small faces, cut 6 strips of paper equal to length of fan's fold and twice its width; fold in half lengthwise. Use a glue stick to attach strips to fans (see below), and fans to one another, forming a circle. For larger faces, glue 1 edge of folded paper to next until you form a circle. Hot-glue center to secure. Print templates (get the pumpkin, cat, and owl templates), enlarging or reducing to desired size. Trace shapes onto colored paper twice; cut out. Attach shapes to each side of decoration with hot glue. Hole-punch top; hang using ribbon.